This conference aims to present innovative and creative ethnographic perspectives on the intersection between art, anthropology and contested cultural heritage. One part of the conference will showcase ethnographic work with TRACES: Transmitting Contentious Cultural Heritages with the Arts: From Intervention to Co-Production (EU Horizon 2020 programme, 2016 – 2019, www.tracesproject.eu). Papers selected through an open call will provide global and post/de-colonial counterpoints to the “European” settings of TRACES and investigate ethnographically and artistically contested cultural heritage (e.g. in museums and heritage institutions, private collections). The purpose of the conference is to open for a critical dialogue with TRACES. 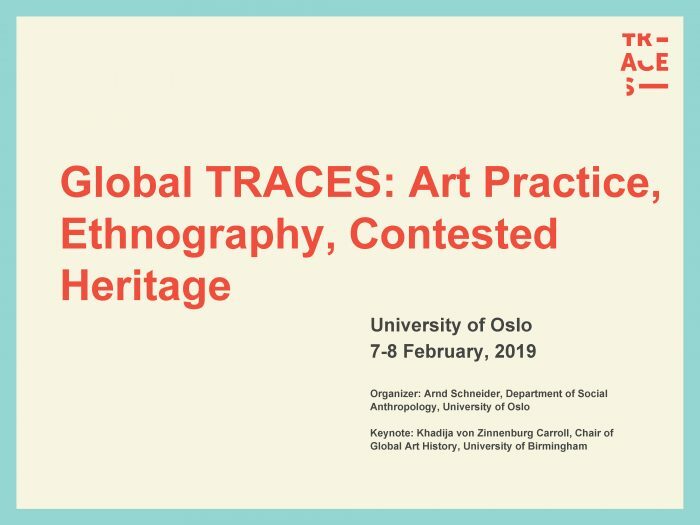 Thus, as in our work with TRACES, we are particularly interested in presentations that focus on notions of serendipity, artistic process/production, and relationality in their research with global contested heritage. Arnd Schneider, Leone Contini, Matei Bellu, Katarzyna Maniak, Blaz Bajic, Aglaja Kempinski, Laura McAtackney. Christian Sørhaug, Kjartan Fønstelien and Serge von Arx –“Our Gruesome Cultural Heritage” Cultural heritage plays a central role in contemporary efforts at nation building. Attendance is free (and includes coffee and tea break provisions and reception), and everybody is welcome to attend the conference. BUT we need confirmation of the numbers for our planning, and you have to REGISTER, providing your full contact details and affiliation, with the conference administrator Eline Olafsrud by December 20, 2018 (DEADLINE).